The 007 Magnetic Glo-View Torpedo Level is a very useful tool to have in any toolbox and the many features this product has makes it an ideal torpedo level for just about any job. The Glo-View vials enhance the readability when working in poorly lit areas and the magnetic edge allows the user to utilize both hands when leveling. This review was done by Tom Hintz, a woodworker and metalworker that found the 700 to be quite useful. This review can be found in it's original form at NewMetalworker.com. One tool for metal, wood and either in the dark? The Johnson Glo-View® Magnetic Torpedo Level does everything a regular level does but steps out front with the glow and magnetic capabilities. have tried to get a 45-degree brace actually at 45-degrees while clamping it up for welding at the same time - with one hand no less - find this a very welcome and useful advancement. 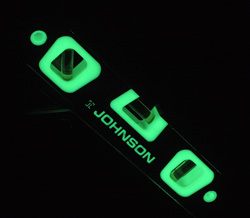 Also, the glow-in-the-dark frames surrounding the vials actually have utility beyond taking the Johnson Glo-View® Magnetic Torpedo Level into the closet to see if they really do glow. They do. I suspect that the folks at Johnson Level and Tool are pretty keen on this tool as well since they thought it up. The Johnson Glo-View® Magnetic Torpedo Level is reasonably normal in its overall looks and dimensions. At 9-7/8"-long by 2-1/16"-tall and ¾"-thick it is much like other torpedo levels. It's what you find within those common dimensions that's different. A soft-feeling body is surrounded by non-conductive composite upper and lower frames. Between the lack of electronics and the non-conductive frame we can leave the Johnson Glo-View® Magnetic Torpedo Level on a metal component while tack welding it in place to be sure it stayed where we wanted it. Rare earth magnets provide the grip on metal that can free up one or both of your hands. That can make you more accurate as well as less frustrated. The Johnson Glo-View® Magnetic Torpedo Level has the traditional array of 3 bubble vials, horizontal, 45-degree and 90-degree. Surrounding each of the vials is a white frame that glows in the dark. More importantly they glow in the dim and make the vials easier to read when you are working inside of a large project or it's just getting dark where you are working. Since contractors and DIY'rs don't work just 9-to-5 this feature could come in handy more often than you think. For those who grew up in a glow-free zone, the frames are "charged up" by exposing them to bright light. There are no electronics or batteries that some of us would almost certainly forget causing the glow. 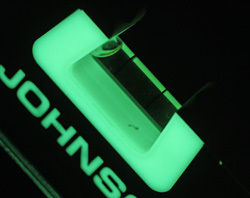 Probably the most unique feature of the Johnson Glo-View® Magnetic Torpedo Level is a row of three rare earth magnets along its bottom edge. The top and bottom edges are beveled so they can accommodate rounded materials but the magnets makes this a totally hands-free tool in many cases where an extra hand can make life much easier. Johnson chose rare earth magnets over the more economical alternatives because of their superior holding power. While three magnets are built into the bottom edge only one is really needed to hold the Johnson Glo-View® Magnetic Torpedo Level. That can come in handy when you have a short piece or short area on which to place theJohnson Glo-View® Magnetic Torpedo Level. The magnets also mean that we can literally hang the Johnson Glo-View® Magnetic Torpedo Level on the underside of a metallic piece as well as the top or side surfaces. I know that some of you are thinking that the glow thing doesn't work. Well, it is impressive when it gets dark (left) out but get closer (right) and you can see the bubble even when it's trying to hide at the end of the vial! In everyday use the Johnson Glo-View® Magnetic Torpedo Level is nice. However, since everyone I know may call themselves a woodworker or a metalworker, all of them work with both materials to some extent. I also am firmly in the dual-material regime but I can recall many instances when the Johnson Glo-View® Magnetic Torpedo Level would have been nice to have. Just one instance is when adding a piece to a metalworking project. Being able to leave the Johnson Glo-View® Magnetic Torpedo Level on that piece while I adjust and clamp it at the angle desired for welding is a huge help. More common is trying to get a part or all of a project level within a structure for welding. Being able to set the level on the piece and use both hands to secure it relieves lots of frustration. Of course, here are the many normal uses for a good torpedo level that justify having a nice one in the shop. 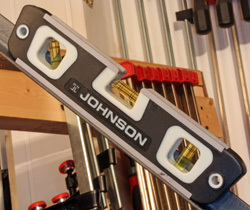 The Johnson Glo-View® Magnetic Torpedo Level is a good quality leveling tool as we would expect from Johnson Level and Tool. But the addition of the glowing frames and rare earth magnets extend its usefulness considerably. With a street price around $18.00 (2-18-2011) the Johnson Glo-View® Magnetic Torpedo Level is a good value without the glowing and magnetic features. It really makes no sense, fiscally or intellectually to buy a plain torpedo level instead of the Johnson Glo-View® Magnetic Torpedo Level. But, I know some will be swayed by a pretty price and we will be able to recognize them by their crooked projects. Be nice to them anyway.